Sometimes dogs may cough and vomit at the same time. Excessive coughing can cause even otherwise-healthy dogs to vomit. 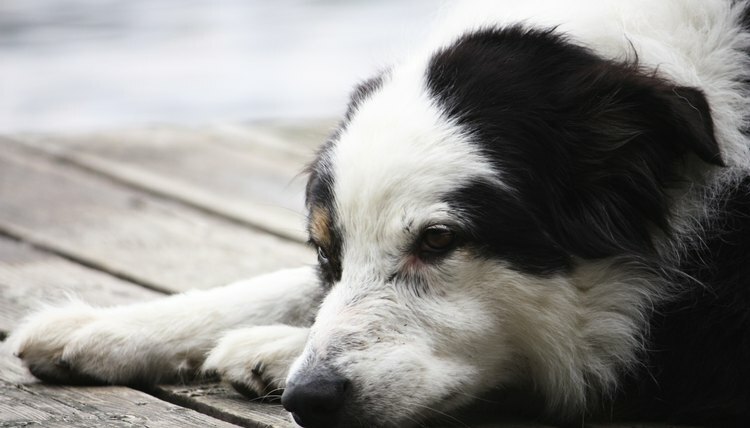 Vomiting also may irritate a dog’s throat, causing him to cough. Dogs often cough when they have something stuck in the mouth, esophagus or stomach, while dozens of different conditions can cause vomiting. If the coughing and vomiting persist for more than a few minutes, or are accompanied by fever, bloating or other symptoms, seek veterinary help promptly. It is important to distinguish vomiting from coughing. Coughing is indicated by hacking sounds and substantial movements of the chest and ribs, while vomiting may cause gagging sounds, but accompanies stomach contractions. Vomiting dogs usually will purge the food in their system along with a quantity of bile. By contrast, coughing rarely produces more than phlegm or mucus. If your dog is coughing up white phlegm, rather than vomiting white phlegm, it is more likely to indicate kennel cough or another respiratory disease, such as pneumonia. Additionally, heart disease and tracheal collapse can cause dogs to cough, although these conditions may not cause your dog to vomit. Kennel cough usually resolves on its own, but pneumonia and other infections may cause serious illness if they are not treated. It is possible that your dog has something caught in his throat, which is causing the phlegm and coughing. If your dog’s coughing seems productive, he may need no help coughing up the item. However, if your dog seems panicked, has trouble breathing or produces a honking sound, seek veterinary care immediately. How Fast Does a Guinea Pig's Heart Beat?